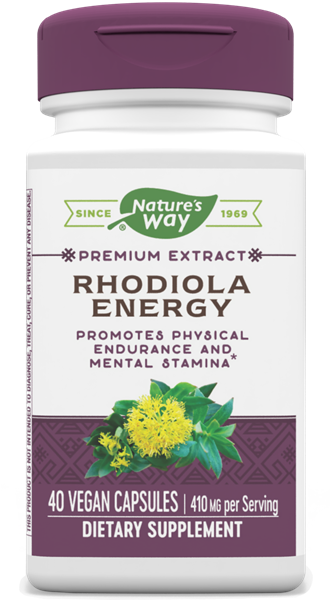 Rhodiola Energy™ / 40 Veg Caps - Nature's Way®. Why use a rhodiola supplement? Take 2 capsules in the morning on an empty stomach 30 minutes before a meal. May begin with 1 capsule daily and gradually increase to 2 capsules. Why is standardizing rhodiola important? The roots of Rhodiola rosea are used to source its unique alkaloids. Rhodiola rosea is rich in rosavins and salidrosides; which are its active components. The Rhodiola rosea extracts studied have typically been standardized to contain a minimum of 3% rosavin and 0.8 – 1 % of salidroside. This is the same standardized levels of beneficial alkaloids used in Rhodiola Energy.